"Ingraham's 15," mentioned several times in this book, refers to the 15 crewmen of the destroyer USS Ingraham (DD694) who died when a kamikaze aircraft hit the ship on May 4, 1945. 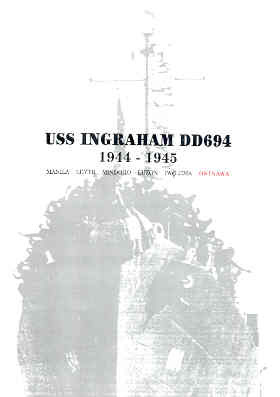 This privately-published book provides a summary history from Ingraham's commissioning in March 1944 to the end of the Pacific War in August 1945. John Charney, who served aboard Ingraham from 1962 to 1964, also includes in this spiral-bound book a huge number of photos and other documents from the destroyer's wartime years. The author, even though he served on Ingraham many years after the end of World War II, writes the destroyer's war diary as if he were a crewmen in 1944 and 1945. The war diary, arranged by month from March 1944, serves as the book's chapters. However, these monthly historical summaries, generally taken from official Navy documents, run from just a half page to a little more than one page except for March 1944, the month of the destroyer's commissioning, and May 1945, the month of the kamikaze hit at Radar Picket Station 1 to the north of Okinawa. Other than the May 1945 war diary, the author incorporates few personal accounts into the historical summary section of the book. Daily the war has been becoming more and more violent. As for the Special Attack Corps, what can we say to a god of the divine eagles as he goes to the place of decisive battle? We cannot find words to express our gratitude. I beg of you that you destroy the hated Americans with no concern and fears for the future because, imbued with the never-ceasing attacking spirit of the Kamikaze Special Attack Corps, we will steadfastly increase our production until the Japanese empire is crowned with the garland of victory. The book mentions that Kanichi Horimoto flew a Zero (p. 151) from Miyakonoto in southern Kyushu (p. 157). However, the 60th Shinbu Squadron to which Horimoto belonged actually took off from Miyakonojo Army Air Base in Hayate Type 4 Fighters (Franks) on May 4, 1945 . On the body of the Japanese flier who almost sank our ship was found a note from his government glorifying his Divine mission to save his country–another tragic victim of the many inventions of mankind. All during our enemy action I can say that panic never was apparent among the crew as far as I could tell. Everyone did what they had to do almost automatically and with the sense that it was just another exercise. If it was true that there were no atheists in foxholes; it was also true that there were no atheists on target ships. In the early morning of May 4, 1945, two destroyers and four smaller ships at Radar Picket Station 1 came under attack by 40 to 50 Japanese kamikaze aircraft. Although the ship's guns shot down several of the incoming aircraft, four planes hit the destroyer Morrison (DD560), which sank in about ten minutes after the first hit. This command witnessed many suicide attacks during the Philippine Campaign. Most of those were single plane attacks. Coordinated attacks consisted of not more than three or four planes; such attacks were rare and were poorly executed compared to those experienced on May 4th on Radar Picket Station One. 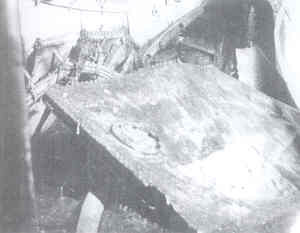 In the latter event an estimated forty to fifty planes were thrown into the attack. The first planes were modern fast types, appearing in small groups, or singly, and approaching from several widely separated sectors. These attacks built up until the CAP (Combat Air Patrol) had more than it could handle, at which time the enemy began to slip through. Soon enough attackers had shaken free of our fighters to saturate AA (anti-aircraft) defense. At this period the enemy began attacking from all directions at different altitudes, pilots apparently attacking independently as opportunities were offered. It was at this stage that Morrison took her first two hits and that the first formation of float planes put in their appearance. The float planes came in from the north flying low and attracted many of our fighters. Following the float plane attack came an intensified attack by fast land planes. Observers state that the coordinated attack made upon this vessel came from a loose formation from which each plane peeled off to attack from different directions as simultaneously as possible. After the fast planes had expended themselves two more formations of float planes approached. Those two formations did not reach attack positions until well after the enemy's major effort had been exhausted. It is interesting to note that the two last float plane attacks were not coordinated with the main attack. Furthermore, the airmanship displayed by the pilots of these two formations was of low order. Those two formations reminded one of flocks of pelicans - each bird following the leader in a loose, ragged file and flying very close to the water. Only one individualist broke away to approach independently. All fell easy prey to our fighters. The impression gained was that the leader of each formation was an experienced aviator, but that all of the others had had barely enough flight time to solo. USS Ingraham DD694: 1944-1945 provides the ship's wartime survivors and their family members with a fine book of photos and other historical items with which to remember the wartime service of the destroyer. 1. The translation on this web page contains a few minor corrections. For example, "youthat" was changed to "you that." "Sukuramachi" was changed to the correct name of "Sakuramachi." 2. There is no Japanese given name of Shikoro, so it appears that the translation of the Japanese character or characters for this girl's name is incorrect. 3. Sakurai 2008. Other sources such as Osuo (2005, 199) and Tokkotai Senbotsusha (1990, 271) incorrectly list the date of Horimoto's sortie and death as May 11, 1945. Osuo, Kazuhiko. 2005. Tokubetsu kōgekitai no kiroku (rikugun hen) (Record of special attack corps (Army)). Tokyo: Kojinsha. Sakurai, Takashi. 2008. Dai 60 shinbu tai (60th Shinbu Squadron). <http://www5b.biglobe.ne.jp/~s244f/shinbutai_hensei-035.htm> (February 2, 2008). Tokkōtai Senbotsusha Irei Heiwa Kinen Kyōkai (Tokkotai Commemoration Peace Memorial Association). 1990. Tokubetsu Kōgekitai (Special Attack Corps). Tokyo: Tokkōtai Senbotsusha Irei Heiwa Kinen Kyōkai.